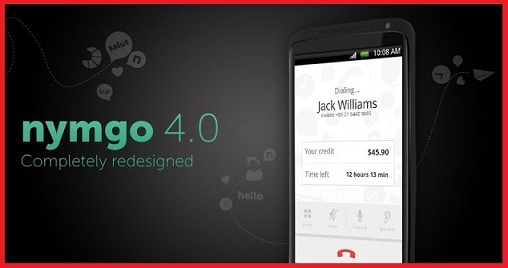 Nymgo for Android Mobiles | Download Nymgo on Android Tablet | Free Pc to Phone Calls, Free Voip Calls to India International ! If you have been looking for making some cheap international calls, then Nymgo is the answer for you. It offers cheap calling rates to many destinations including India, Pakistan and Bangladesh. Nymgo started few years back when they started offering cheapest rates to India, but soon lost its charm. However they are back again with a bang and many people have again started using Nymgo. Sometime back, Nymgo was offering exclusive trial bonus of $3 just to try the service. This offer by Nymgo was a big hit. Using their service is quite easy as it offers lots of ways to make calls. If you are having an Android Mobile or a Android Tablet, then Nymgo has good news for you. You can use Nymgo on Android Mobiles to make cheap international calls. I am sure you must be using internet on your Android mobile, so it makes too much sense to use voip for your international calling needs. You can install Nymgo Android app on your mobile and start making cheap international calls. Our readers with iPhone need not get disheartened as Nymgo has an iPhone application as well. No hidden fees or charges, you see the price of the call before you make it. All the above features does not actually matters, the important thing is Nymgo offers very cheap rates with no hidden charges. So using the mobile voip (Nymgo Android application) makes too much sense as you will be saving lot of money. The Nymgo android app is though launched and available in Android market however many have written some bad reviews like the app crashing etc... I would say Nymgo has to work hard on the Android app! However if you are a Nymgo customer having an android mobile, then Nymgo for Android application is a must download for you! Why pay so much when you can call for free.